Ankle boots - very comfortable and durable Shoe that almost never gets wet and does not weigh more than usual autumn sneaker. But this Shoe has one significant disadvantage - they are long and heavy lacing. However, for the laces didn't cause a lot of trouble, you need only a little skill. On the one hand, lace-up ankle boots - it's not so difficult. Enough to lace ' em up once, and then just slightly loosen the drawstring top. But all is not so simple: only with proper lace-up ankle boots is able to perform its main function (to protect the foot from injury and sprains). Neumel lace-up can pull the leg and interfere with the blood supply of the foot. Today it is considered the most reliable lacing through loops and rings, this is worth remembering when choosing shoes. But for hooks, in addition to the laces, can cling to any objects and even clothes. Traditional and well-known lacing through holes may unevenly compress the foot, leading to discomfort in addition, these openings in bad weather do not protect from moisture. 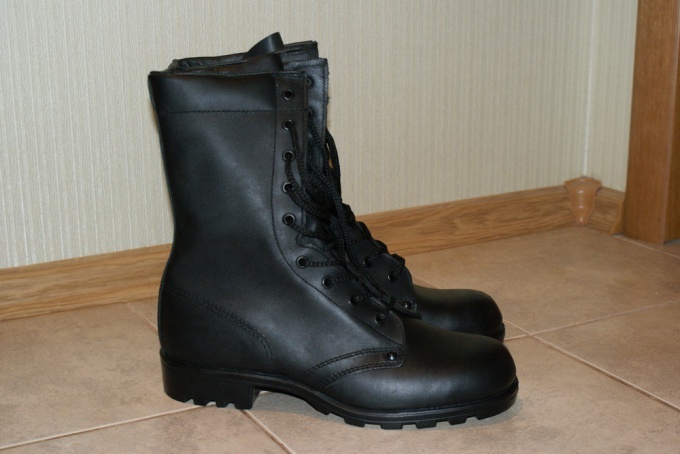 Before lacing the boots, be sure to put them on the leg. The only way you can properly adjust the density of the lacing and the bottom at the toe and heel. Lacing, "cross". It is very simple: take the lace and thread it horizontally in two side vents on the bottom (at the toe), then the ends of the lace cross among themselves and pass upward into the next hole. This type of lacing tightly pulls the ankle boots to the feet. For of ankle boots ideal lacing the ladder. Take the lace and thread it horizontally in the two bottom holes, then the ends of the lace not perekrashivat, as in the first case, and raise right and pass to the next series of holes from the bottom up. Then cross the ends of the laces and thread them through the loop formed by the opposite end of the string, then get the laces right up. But the most suitable for the tibia is the so-called "army lacing". It runs in a few seconds. Take the lace and thread it horizontally in the two lower holes, then lift the right and thread through the next hole. After that, cross the laces and thread from the bottom up into a number of holes, then lift right.